Japanese website PC Watch has compiled some information on the future of 3D NAND from slides of presentations held during this year’s Flash Memory Summit. If the predictions in those slides become reality, we could see 3D NAND with more than 500 layers, and 512 Terabyte SSDs in the coming years. That’s far away from the current numbers. PC Watch summarizes that currently all major NAND manufacturers work on (readying) mass production of 96-layer 3D NAND and that the largest capacity 3D NAND dies currently available can hold 1.33 Terabits of data. NAND manufacturers are however continuously working on ways of adding more layers to increase data density and thus lower the price per GB. SK Hynix showed a slide during a presentation that the company expects to scale to 500+ layer 3D NAND in the future. The company markets its latest generations 3D NAND as 4D NAND and the slide mentions that SK Hynix currently has 128-layer 4D NAND in development. After that, the company plans 4D NAND that consists of 200+ layers and after that, the company hopes to scale to 500+ layers 4D NAND. While SK Hynix doesn’t provide a time frame and doesn’t indicate when it expects to start production of 500+ layer NAND, analyst Jim Handy from Objective Analysis did provide an indication during a presentation. 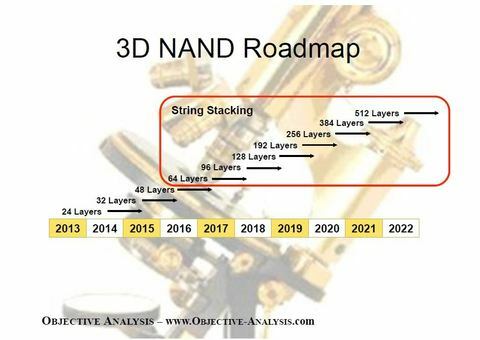 On a slide he shows a road map that reveals the analyst expects 500+ layer 3D NAND by the second half of 2021. 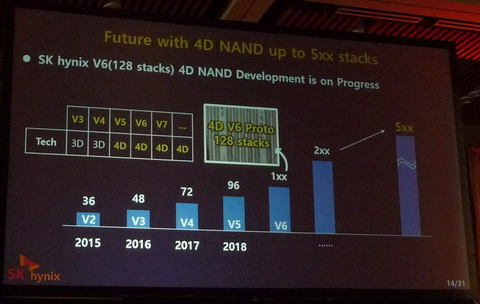 According to the same slide, we could see 128-layer 3D NAND next year already. Needless to say, this is only an indication, NAND manufacturers will likely need to overcome bigger technical challenges while the number of layers increases. PC Watch also further daydreams that 512 Terabyte SSDs are possible when combining the numbers. Quad Level Cell (QLC) 3D NAND with 512-layers means a single die has a capacity of 8 Terabit (1 Terabyte). When 16 of those dies are combined on a single chip, it has a capacity of 16 TB. With 16 of those 16TB chips in a single 2.5″ form-factor SSD, the capacity of such a drive would be 512TB. That’s far from the current common capacity of 256GB to 1TB.